One of the most interesting sessions of the class throughout the quarter occurred last Tuesday. Each group wrote their POVs on their board before a 15-minute ‘feedback’ session. 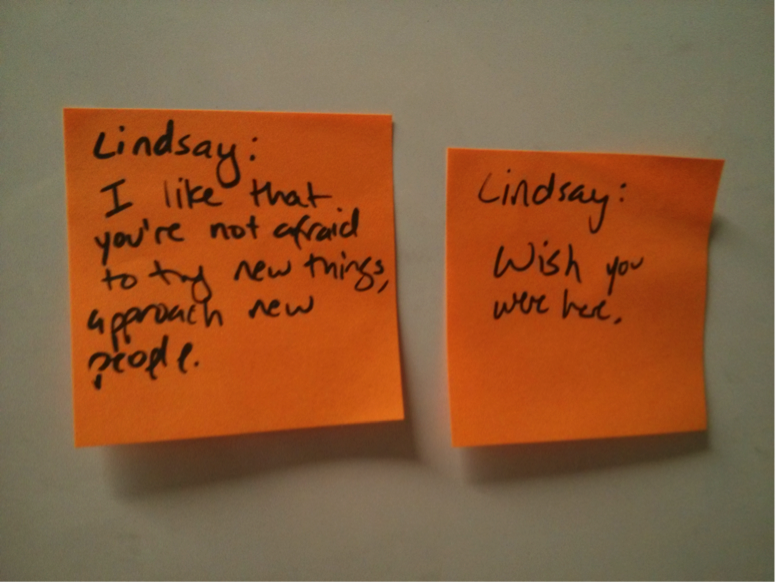 During this session, we walked around the room, inspecting POVs of other teams, and posting comments on colorful post-its. The solitary and fluid nature of it was inspiring – we were given the time to stand in front of each board, take in the silence to gather our thoughts and mull over the masterpiece in front of us, write down our own individual notes on colorful post-its and tacking them on (akin to art-gazing at a art museum). We then went back to our own boards, read through the notes by the other class members and came together as a group to talk about the issues. It was interesting when many similar points were brought forth – for e.g. one of our users was a VA who formed the fringe community in a predominantly Latino community. We inferred his need through our conversations for his need for purpose and meaning. The same comments echoed throughout – the phrase was too vague and did not contain much meaning in and of itself. When we later presented our POVs to the teaching team and a different group, we were able to unearth richer insights through the stories we shared, and buffed up these insights and needs. It is always easy to get caught up in the world of vagueness and abstraction, and finding a concrete need that paints an immediate picture to anyone reading the POV was crucial. Another important but easily overlooked aspect was the importance of good descriptive words of the user. When you do not have pictures, being able to eloquently capture the ‘soul’ of the user through descriptive words was important. For example, one of the composite set of users were users disgruntled about the insecurity in EPA. When we started describing them in further detail through the descriptive adjectives, we realized that they were all busy parents, and had this natural family-instinct (or as Jenny says best, Momma-bear gut feel) to protect their family when push comes to shove. Being able to capture the ‘busy-ness’ of this set of users added an important element when we later proceeded to the How Might We (HMW) statement phase, but more importantly, allowed us to understand better the rich dynamics within the user group. Nadine came in a couple of days later. Explaining to someone so deeply involved in the EPA issues that we had only been working on for the past few weeks was intimidating, but it was helpful that she was able to lend her experience to deepen our insights. She redirected our attention to certain POVs (vs the rest) which seem to be prevalent issues to her during her time at EPA. While these ‘more prevalent’ POVs might or might not offer the most interesting solution space, to vet these POVs through Nadine offered us a sense of priority on which area to start first. We later brainstormed on the HMW statements for the 2 main POVs that contained these insights – disgruntled users who were willing to act but whose responses have been previously ignored, and the commonality of projecting a positive image that cuts through a wide strata of society. For the 1st brainstorming, we took on an approach that was very similar to what we had previously done for the DP#1 project. We set a time limit, individually came up with ideas on post-its before coming together at the end of it all to cluster the ideas and build on the ideas. One of the interesting ideas that came up was a smartphone app that would allow users to report crime happening around them. We were cognizant that the main goal of the project was to build a sense of community amongst, but were equally aware that the main complaint that kept coming forth was the lack of police presence and security. The app was interesting as allowing users to report crime issues seem to hit at the security layer, but there was this inherent unspoken need of being able to monitor the crimes going on and have been reported to by your neighbors. There were definitely many key assumptions surrounding this idea, the most basic premise of which is – would people actually use it? 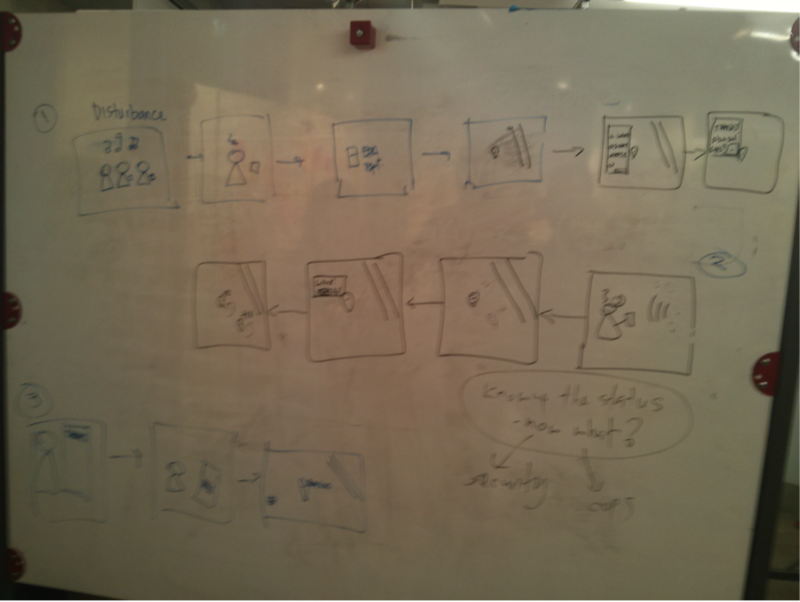 Jenny was awesome in this regard – she helped us to develop a full storyboard for the different users. Key questions that came up during this phase – think of the flow of the story, what happens at each point in time (what type of app interface should the user expect to see). Drawing it up on the board ala d.school style definitely crystallized our thinking, and we were able to fill in the gaps with some hypotheses which would be later tested. We were also enthralled by the possibilities that this app unfolds – could this be a seed upon which dissemination of information (community events to increase sense of pride etc) could be done, could the ease of dissemination of information incentivize Equity Residential (the property landowner) to participate? Could the app be crowdsourced or developed by EPA residents, akin to the Palo Alto Online article detailing how a group of EPA girls came up with a graffiti monitoring app that hit at a pressing community issue despite all the odds. But it was important to test just the first part – the part that deals with security. For the 2nd brainstorming session, we decided to jazz it up by putting in place 2 extremely diametrically opposed scenarios. For Julian, the HMW statement was to increase the pride in the community. We set 2 different constraints for the solutions, one chunk has to be free (or incur a very small amount of financial investment), and the other chunk involved unlimited resources at your disposal. 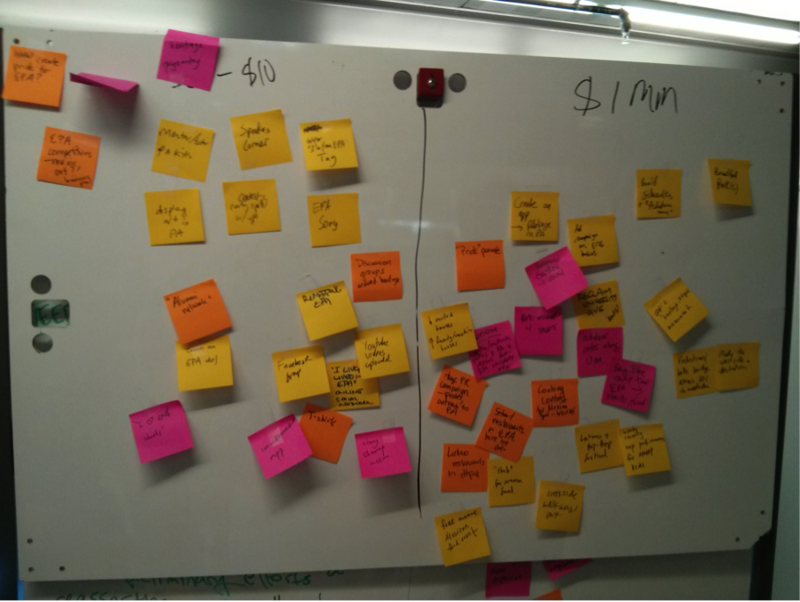 The solutions for both were wide-ranged, and potentially gave us interesting ideas to talk about and build off on. As for today’s class (21st May), we took a step back and did some group reflection. Almost halfway through the project, team alignment is important. We wrote about the aspects that we liked (‘I like ..’) and minor changes that could have been done (‘I wish …’) for each person. Personally, considering that my group has been great, it was a challenge to try to think of places that each person could improve on. As always, I realized that I had much to learn and improve myself. Stay tuned to our next post on prototyping in EPA! This entry was posted in Uncategorized on May 29, 2013 by rebootinggov. Address, through design, a way to build a shared sense of community identity and responsibility in East Palo Alto given the current state: changing demographics, challenging geography, lack of public space and resources, and constant pressures of transience and crime. And highlight opportunities to capitalize on existing assets such as the hardworking families and family investments in youth education. East Palo Alto (EPA) is a city with a rich, yet complex history, geography, and population. For starters, the ethnicity of the majority population of the city has shifted several times throughout its history. African Americans at one point made up 90% of the population; now they are only 16%. Community demographics have shifted rather dramatically to a predominantly Hispanic and Pacific Islander population, who now make up approximately 61% and 10% of the population respectively. As demographics have shifted, there is a sense by some, that the community has become more fragmented. There had been a significant level of home ownership among the African‐American population, but as they left EPA the profile of the community shifted from one of home ownership and longevity to one of renting and transience. On the west side, where one‐third of the population lives, it is primarily a rental community with approximately a 25% annual population turnover. There are also 58 churches in EPA, and many of them are African‐American in heritage. It seems like many of the churches have their pews filled with former residents who come back to the community to worship each Sunday but then return to their homes outside of the community afterwards. For many EPA residents, the pattern of living is the reverse. Most work and socialize outside of the community and then retreat to their homes at the end of the day. Schools, which normally provide a neighborhood anchor, have a hard time filling that role here. EPA doesn’t have its own school district (it is part of Ravenswood School District with Eastern Menlo Park) or a high school. Furthermore, many parents elect to send their children to one of the many charter or private schools in the area rather than their local public schools. 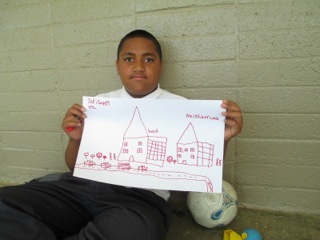 School, like many other aspects of daily life in EPA, often take place outside of the neighborhood. Issues of crime only exacerbate the lack of neighborhood connectivity. Over the years, the crime rate has decreased from its notoriously high levels of the late 1990s and early 2000s. However, that notoriety still remains a pervasive part of the city’s reputation for both those inside and outside of the city, supporting the internalization of daily life for EPA residents. The fragmentation of EPA is reinforced by the physical geography of the City. Over the course of its history, the City’s boundaries and spaces have been defined by annexations by its wealthier neighbors and private interests. For example, a recent disastrous flooding in the city was exacerbated by a geographic quirk that was done many years ago to maximize the quality of a golf course in another city. There are very few public spaces in the City, and none on the west side of town, where a laundromat, taco stand, and 7‐Eleven exist as the only neighborhood landmarks. University Avenue, which cuts through the heart of the City, is the equivalent of a freeway twice a day, with motorists driving through the community to get to their jobs in Silicon Valley. Given these factors, the city has struggled to identify effective ways to increase not only the sense of community, but also to facilitate productive and inclusive community engagement. Despite the significant challenges, EPA has a visionary and energetic City leadership. For this project, we are working with the City Manager, Magda Gonzalez. She recently began her tenure, taking the reins late last year. Armed with many years of experience in local government here in the Bay Area, she is passionate about helping EPA tap into its potential, recalibrating the relationship between the municipal government and EPA citizens, and rebuilding a shared sense of community. This entry was posted in Uncategorized on May 20, 2013 by rebootinggov. This project was my first experience with the practice of human-centered design (HCD). The steepest learning curve for me was in figuring out how to leverage the design thinking process to extract expertise from a multidisciplinary team methodically in order to deepen empathy and generate novel solutions. While the design process itself has clearly defined stages, the incremental steps within each stage are less clearly prescribed. In our teamwork, we tended to have free-flowing discussions, which were insightful but not exhaustive in explaining observations or developing the range of solutions. I wonder whether a more structured approach might prompt team members to be more conscientious in bringing in their own disciplinary perspectives and result in more efficient and thorough empathy and ideation, assuming this could help lead to more novel solutions. Another issue is how to balance the attention given to serving user need and the objective of solving systemic problems. I found it difficult to justify how the ideas we prototyped for the youth could result in better systemic outcomes and account for potential side effects on other users in the system. We needed a theory of change for how serving the user need we identified would improve the system overall. In striking this balance, I think the toughest challenge lies probably not in designing around user needs but around and through the intermediary human relationships and institutional linkages between the individual “user” and the “system”. Therein lie the keys to truly transformative HCD. As a person much more familiar with the Human Centered Design rather than Political theory and systemic thinking, the Sierra Leone project gave me the chance to make attempts to resolve these two different ways of thinking. Originally, I was a bit skeptical about the value of adding systemic thinking on top of human centered design, as I had a feeling that thinking about the system as well as the user would filter thought and limit the range of solutions our team would create, especially since it was challenging to move between these different scales of thought. In the end, I would say our solution proved my skepticism wrong. Knowledge of the political system of Sierra Leone was a key generative tool for our solution, and allowed us to think of ways to connect multiple stakeholders together through our main user: the youth. 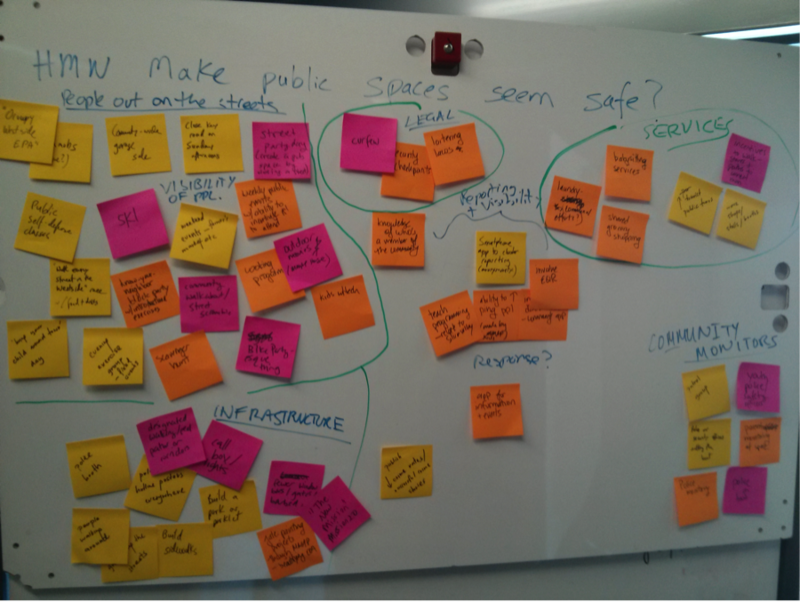 Often in HCD, there is a bias towards creating solutions which work for the user alone; in contrast, systemic thinking encourages expanding the solution space to ideas and concepts which connect and engage different stakeholders. For problems in governance, such as those we faced in Sierra Leone, such solutions may have more potential, especially when designing for communities. The ideation phase of the project has been a breakthrough for me personally. The process of transforming the empathy and insights into many, many potential interventions, meant to serve a specifically defined Point of View, is both enjoyable and mind-expanding. It led us down paths we would not have entertained if we had simply jumped to the phase of defining potential solutions. In previous efforts to build new programs, I’ve jumped straight from learning about the problem to designing a solution. I so wish I had used this process in the past. I am happy with the prototype we have defined for youth. But I know that the hard next step for me would be to avoid attachment. In the past I’ve had to raise funds for ideas, sell ideas to partners, etc. before really launching anything. I’ve built attachment, and struggled to iterate at time. While we won’t be testing this important skill on this project at this time, I’m looking forward to experimenting with prototyping soon. Having recently completed DP1 (woohoo! ), my biggest takeaway was the importance of having a project partner go through the design process alongside you. For me, the hardest part about HCD within our class context was negotiating a balance between my learning, and value-creation for Simeon and Timap. The design process embraces ambiguity, and there are definitely moments where you ask, ‘Where on earth are we? How did we get here?’. These moments are made all the harder when the project runs on a time-line (‘If we follow an unproductive line of thought, will we have time to backtrack?’), and has such high stakes (justice and economic development in Sierra Leone). When Jenny, Jeremy and Liz made project arrangements with Simeon, they told him, “We have no idea what will come out of this.” Them sharing this conversation with the class was comforting; it reinforced the idea that we were participating in an experiment and, in the spirit of experimentation, there were no guaranteed outcomes. At the same time, it was hard to reconcile this sentiment with our use of resources, especially given our week-long trip to Sierra Leone, and the team’s numerous meetings with NGOs and government officials. Particularly conscious-twinging were the communities’ investment in our project–in a number of villages, crowds of people spent the entire day waiting for our team, so that they could share their grievances with us. Within this context, Simeon’s immersion in the class took on additional meaning –having him learn beside us emphasized that we were in a learning environment. Given these reflections, I’m curious about DP2: Magda and Nadine will be more conventional project partners, and we will have to use a different toolkit to engage them in our design process. This entry was posted in Uncategorized on May 9, 2013 by rebootinggov. When those of us who traveled to Sierra Leone arrived back on campus, we brought with us real determination to do something useful for Simeon Koroma and the ordinary Sierra Leonean villagers whom we met while in country. The empathy work we had done had left us feeling they were getting a raw deal and that Simeon’s group, Timap for Justice, was positioned to do something about it, if only it could focus its energies on the right agenda. Our first challenge in helping develop a solution for him, and for the people his agency helps, was to engage the two members of our team who weren’t on the trip. This was both easier and more difficult than it may seem at first. It was easier because of the skills, smarts and commitment they shared with us in engaging this process. Chi, for instance, has had more design school experience than the rest of us, and was able to help draw out of Ramya and myself concrete images from our time in the field. He asked, for instance, how a particular chief felt when it became clear he lacked the power to protect his people. He knew to ask what the context was, and helped us flesh out our reports. Guy was able to bring a businessman’s focus to some of our discussions, and helped keep me, anyway, more organized in my delivery than I might have been otherwise. The task of firing up our team members was difficult in other ways. Not having been there, there wasn’t the immediate emotional commitment that I believe Ramya and I felt form the beginning. The challenge for them, at the outside, was likely more of a puzzle to solve, or a set of questions to answer. I think we succeeded in bridging that gap, but I do think it’s one of the key challenges to consider when designing future projects of this nature. It’s possible that a higher level of engagement from the at-home team during the week might help narrow that gap. Rather than just conducting one set of interviews with a mining company in an analogous situation, for instance, maybe the at-home team should seek out Sierra Leonean expatriates and do more in-depth empathy work. The point here is only to suggest that there might be a way to make the two teams situated on more common ground when the go team returns. Once we moved into the needs stage and later began brainstorming, the differences between the two halves of our group faded, however. That was helpful, because the ideas presented needed to be, and were, treated equally regardless of whether they sprung out of observed experience or second-hand accounts. The other challenge, I think, of this process had to do with time. Five weeks is a short space. There are real benefits of being on a tight deadline. Toward the end I was actually relieved that we were nearing the end and that we had been forced to decide quickly on a specific challenge for which we were looking to design a solution. Still, we all had, I think it’s fair to say, a feeling that other good ideas – rival users whose needs were equally great, competing how might we statements and the also-ran solutions – were left on the table without really being evaluated. We were asked to keep notes of these in an appendix and I think it’s smart that we did because in a more traditional setting we’d almost certainly have to revisit some of those key ideas as we run into problems with the solution we ultimately chose. Bottom line: The whole endeavor at times felt like the academic exercise that it was, and less of an project intent on create real solutions. One possible improvement would be to keep the clock ticking – forcing the next group to just as speedily make decisions – but built into the schedule two or three classes where the object is to circle back and consider the ideas that were given short-shift, and ask what elements of those insights or discussions could be relevant going forward. A closing note about what we did come up with. We’re quite proud of the results. We believe that the core of our idea, namely the creation of an association of landowners that could work across village borders, has the potential to create a people-powered platform that could implement, or experiment with, all sorts of improvements in the future. That we arrived at this solution was a testament to the team-building aspect of the project, and to the capacity for members of the team to have their minds changed by ideas they got excited by. solutions immediately — and honestly, at times it felt frustrating. Sierra Leone communities that we never would have surfaced otherwise. discussed them in more depth. assess the results (if at all) later. can test it further with our neighbor. Little more than a week ago, the challenges involved in selecting a user situated right at the center of the mining-concessions ‘system’ had barely crossed our minds. As we moved quickly from defining a PoV to the brainstorming process that through HMW statements led us to a solution within just one week, the system surrounding our selected user came into focus in all its multifarious complexity. The Paramount Chief, our selected user, stands at the confluence of governmental, industrial, and community interests, an intersection vital to the concessions process. We soon realized this challenge as an opportunity, both to empower rural communities through their traditional authorities, as well as to experiment with the interplay between systems-level and user-centered design process for a user caught squarely in the middle of this system. We unearthed our first insight from a wealth of post-it notes produced while unpacking the interviews from our fieldwork: according to custom, any actor interested in Sierra Leone’s provincial resources—be it government officials or company representatives—must go through the Paramount Chief of that chiefdom. And despite allegations of corrupt Paramount Chiefs and the intense feeling of disempowerment in this position, actors in the system abide by this rule. At the heart of this insight was a fundamental idiosyncrasy: despite such a primary de jure role as chiefdom gatekeeper, our Paramount Chief was a de facto colander through whom information ran without ensuing action. The second critical insight we identified through our empathy work was that despite the Paramount Chief’s stable political position, his impotence vis-à-vis mining companies and government, paired with the reality of his community’s hardships, had exacted a heavy emotional toll – he felt literally small and overwhelmingly powerless. This palpable sense of disempowerment visibly permeated the community at every level. More subtly though, we realized through unpacking the Paramount Chief’s outbursts of expression, that this ‘disempowerment’ was tied to a failure to provide justice for his people, the resulting reputational cost, and a profound sense of shame. Thus given these two levers of insight – the shame of the Paramount Chief over his disempowerment and declining reputation for justice on the one hand, and the centrality of his role in the concessions process on the other – we asked the following questions: How can reputational concern be leveraged to become an incentive for action? And how can we help the Paramount Chief strengthen his bargaining position, sense of empowerment, and ultimate ability to provide justice for his people in the negotiation of mining concessions? Our solution involves a new approach through an old institution. We seek to leverage the PC’s concern for a just reputation through effective peer pressure –information sharing and relative benchmarks –by introducing contract negotiation workshops and legal assistance into the long-standing District Councils of Paramount Chiefs. We learned through our fieldwork that mining companies currently confront Paramount Chiefs individually to push through contracts compensating displaced villagers – often inadequately and at times illegally. We hope that providing these ~25-Chief bodies the tools necessary to negotiate mining contracts more effectively will empower individual Chiefs, while simultaneously consolidating their overall power in the concessions process against this divide-and-conquer approach. Why peer-pressure? The empathy work in SL and the additional information extracted from our conversations with our client, Simeon Koroma—whose insights have been vital to this process—revealed an intricate net of power relations whereby community dissatisfaction, though present, did little to steer the Paramount Chief from feeling sorry to taking action. At the same time, the relational subordination of the Paramount Chief to the government and mining companies—witnessed firsthand in the field as well as evident from a simple look at the Mines and Minerals Act 2009—left little room, and even fewer incentives, for independent action. With powerless communities providing only complaints, mining companies providing only notice of occupation, and government ‘superiors’ providing only instructions, the Paramount Chief seemed fresh out of allies we could harness for his empowerment. In the absence of suitable actors within this complex system we identified the one group with political power that the Paramount Chief can turn to: his peers. The difficulties of each Paramount Chief may vary by chiefdom, but the potential for cooperation is inherent in the traditional organizational structures in place. While we were initially interested in the national Council of Paramount Chiefs, in order to being our initiative closer to the community level, to a smaller scale, and among Chiefs with greater familiarity and commonality, we alighted on the District Councils of Paramount Chiefs. These Councils, one in each of Sierra Leone’s 12 districts, meet approximately monthly to discuss issues common to the district. They have near perfect attendance. Mining issues, however, have yet to be raised formally. One reason for this lack of collaboration may be that mining concessions are coveted as potentially lucrative for the Paramount Chief who needs no public discussion of these details. Another, more basic reason is that lacking the relevant knowledge and expertise to evaluate and improve mining contracts, such a discussion has no motivation. Legal assistance, from Freetown lawyers whose families and roots are in the provinces, to renegotiate contracts that do not meet legal requirements and to negotiate future contracts from a stronger and more informed bargaining position. At present, legal assistance is provided by the mining companies themselves. Admittedly, leveraging reputation-consciousness through peer pressure and solidarity is easier said than done and implementing our solution will require creating the right incentive structure whereby cooperation may trump competition and hostility yield to mutual aid. Yet we have hope in this idea, which, through the design process, has brought something new to the table in identifying a set of interpersonal relationships (among Paramount Chiefs) whose potential has long remained untapped. Moreover, in taking advantage of an existing institutional structure and one with close ties to Timap for Justice, our solution is easily implementable. We can only hope that our client (and perhaps other readers) will be as energized by the final product as we have been throughout the process that led us to formulate it. This entry was posted in Uncategorized on April 29, 2013 by rebootinggov.